Luxury Stone Villa with the Best Sea View in Town! Serenity Retreat apartment offers the highest standard of accommodation for the reasonable prices. Serenity Retreat Villa was built from the world famous Brac's stone with every attention to detail by local stone masons. The best quality materials are used throughout: granite steps, inox fence, stone courtyard, air-conditioning/heating in all the bedrooms, internet, and SAT-TV. Apartment itself consists of two double bedrooms (sleeps 4), kitchen/dining, bathroom, hall, and a small balcony. Contemporary furniture inside with the plenty of storage space for your clothes. Fully equipped kitchen. The original paintings in the bedrooms. Apartment has a small balcony with great view over the bay and marina. Plus a lovely outside space: courtyard with a small garden, 2 lounge chairs, large wooden hand-crafted table for 10 persons, and a grill. This is shared outside space for all of the guests of the Serenity Retreat villa. Location of Villa: Just below Serenity Retreat Villa is 'Polaca' square where many events are scheduled during the summer: music shows, dramatical events, fashion shows . ACI Marina Milna is below our villa as well, and it is true pleasure watching many famous yachtsmen during the summer - don't be suprised if you see Beyonce or other celebrity there! The location of the villa is also only a few minutes walk from Milna's landmark - Milna church, stores, markets, marina, restaurants, cafes, bank, post office, and medical office. Besides great amenities, we are glad to provide services for your unique holiday experience: island tours, fishing and boat trips with your host, special occasions, internet, rent a bicycle, laundry. We enjoyed very much staying in! Last summer I stayed with my friends in Milna, a small village on the island of Brac in Croatia. Milna is built in a typical Mediterranean style. 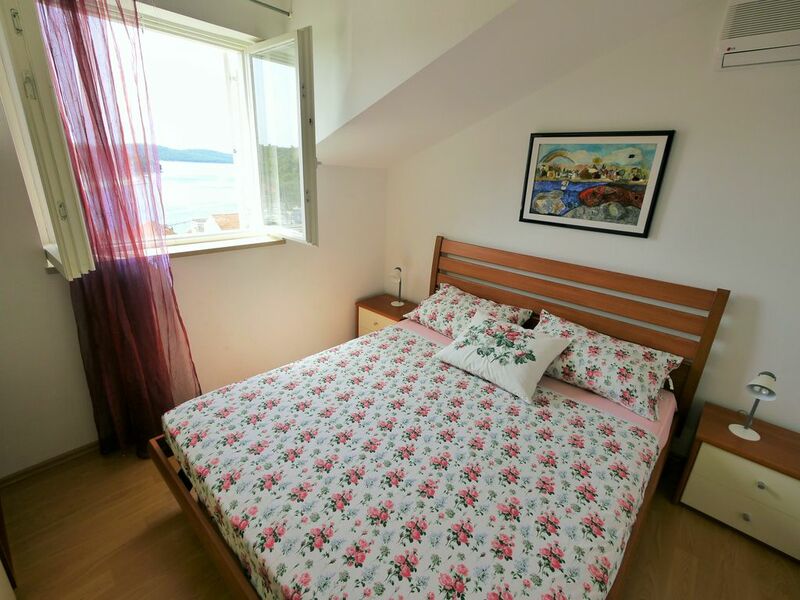 Serenity Retreat apartment is located just above Milna famous landmarks, beautiful local baroque church, 'Polaca' square, and famous ACI marina. Apartment has a small balcony with great view over the bay, marina and village. Apartment was very clean and equipped with everything you might need during the holidays. The courtyard with a small garden, lounge chairs, large table, and a grill is shared outside space for all of the guests of the Serenity Retreat villa. The owners are very welcoming and kind and helpful if you have any additional request. Nearest beaches are within walking distance, but there are many secluded nearby bays with crystal clear water within short driving distance. We enjoyed very much staying in apartment in Milna. Serenity Retreat Villa is located at the heart of the Milna town center. We are located just above Milna famous landmarks, beautiful local church, 'Polaca' square with live theater events, and famous ACI marina Milna. Nearest beaches are within walking distance, but you can also explore secluded nearby bays within short driving distance. We offer early bird, long term (10 days and longer), and last minute discounts. Please enquire for details!